So I went north this weekend for Ma'Dukes Birthday..had a great time with the family, even with the Cold Rain and Snow they had in Upstate NY this weekend. While driving around with my mom I got to experience a bit of the XM/Sirius magical device. I don't mess around with Marconi's invention much nowadze with the interwebs and all those stacks of Cassettes, Lp's and Cd's in my apartment, but this was a cool escape and wouldn't you know it XM has a Grateful Dead channel. In a word...Boosh. The recording of this night is PRISTINE, Keith's piano plunks are crisp, Jerry's note bends weep, and the vocals are up front and loud. A really great capture of this night. 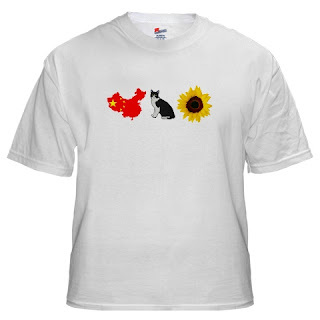 Feel free to Skip right to the magical "China>Rider" if you want, I will detail what you skipped over. Things don't start out all that promising with a shortened, almost cut off "Promised Land" opener, but stick with it good things are to come. Turns out they come quickly actually, with a beautiful "Sugaree" next, all of the Jerry tunes seem to be head and shoulders above Bobby tunes on this night, just the way it goes some nights. Now to China>Rider...The sparseness of just Bill Kruetzman on the drums (Mickey Hart was out of the band for this tour and others) allows the band more blank space and here they show restraint, filling in as opposed to smothering the song. After a pretty standard run through the verse and chorus at about 4 minutes in things really start to get fired up with Lesh's bass hits nimble then at moments notice becoming forceful, constantly moving the song along. Keith's keys are excellent adding a sense of color that radiates through out, Jerry solo's on his own and simply owns the moment, and Bobby's jazzy rhythms entertain. At 6:25 the band lead by Lesh, drop into a clear Uncle John's band jam that is great, allowing Jerry to continue his solo into the unknown while the rest of the boys play with an already old favorite. This is some enchanting music. Bobby starts the first verse of "I Know You Rider" while Phil is still plopping out bass lines and with the power riff Jerry drops post first verse, you can tell he just wants to keep the magic going. There may be some sound issues as Phil says something about "...the front one too..." that is audible on this recording, but there is certainly nothing wrong with the thunder brought after the "Wish I was a headlight/on a northbound train" lyric. There is a bit of a stutter at the end but who can argue with the 13+ minutes that came before it, great stuff. Give it a whirl, Ma'Dukes loved it, I think she may actually tune into the channel on her own now. 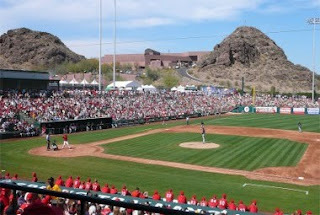 News Break: Turns out Feyline Field is now Called Tempe Diablo Stadium and the Angels hold their spring training there, looks gorgeous. OK other comments/highlights; I have no idea why there is filler in the middle on Archive, I understand someone slapped it on their CD #2 when they burned the show, but I would have thought Archive would have cleaned that up, any way, you can skip over it and come back to check out the Felt Forum 71 show. It's 1973 so you know you are going to get a perfectly blissful "Eyes of The World" that is just dominated by Phil Lesh who is all over the fret board, playing his bass with abandon. This one is intense rumbling everywhere light and airy one measure then rearing back, becoming forboading the next. Complete with the nifty breakdown part, man I love those, this Eyes is great and worth your time. On the other hand, the "Playing in the Band" that ends the first set is a free wheeling jazz experiment clocking it at over 17 minutes, personally, I got bored with this one. There is a whole lot of noodling that goes nowhere real special except for some amp antics and noise right before the reprise complete with Donna's wail I would skip it. The wall of sound gets a bit glitchy at times, but the quality of the recording and the playing on this night make this a fine Monday listen. 11-25-1973 Tempe Arizona Feyline Field.